Homemade Cavatelli Pasta with Oyster Mushrooms and Sausage. Homemade Cavatelli Pasta with Oyster Mushrooms and Sausage; recipe from Puglia. This yummy homemade cavatelli pasta with oyster mushrooms and sausage is a traditional dish from Puglia in Southern Italy. There, they use cardoncelli aka king oyster mushrooms, but you can use other types of mushrooms too. 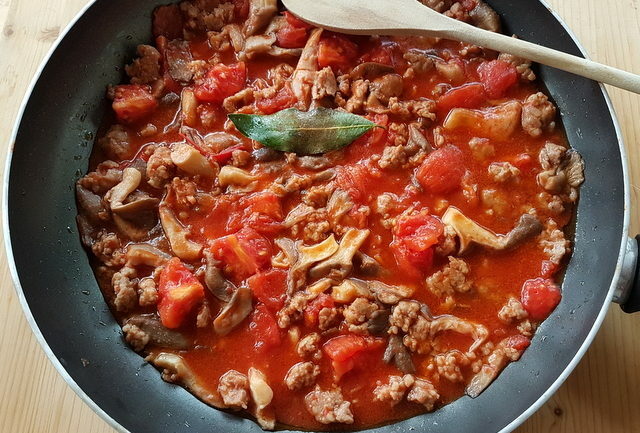 Since starting this blog, I have become rather addicted to pasta sauces with sausage meat. 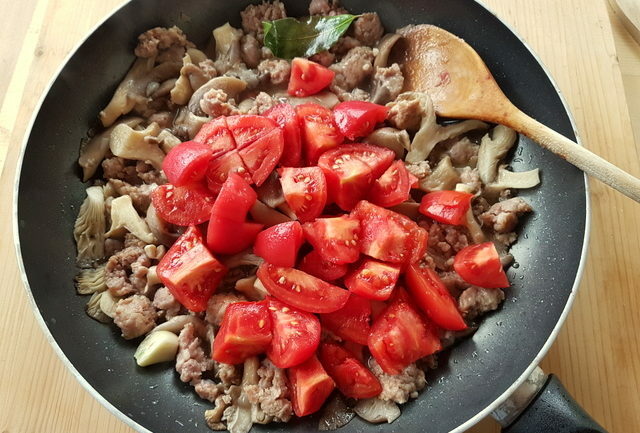 Previously, I had never used sausage meat myself in pasta dishes. What a lot of pastaliciousness I was missing!!! There are many different sausage pasta sauces throughout Italy. 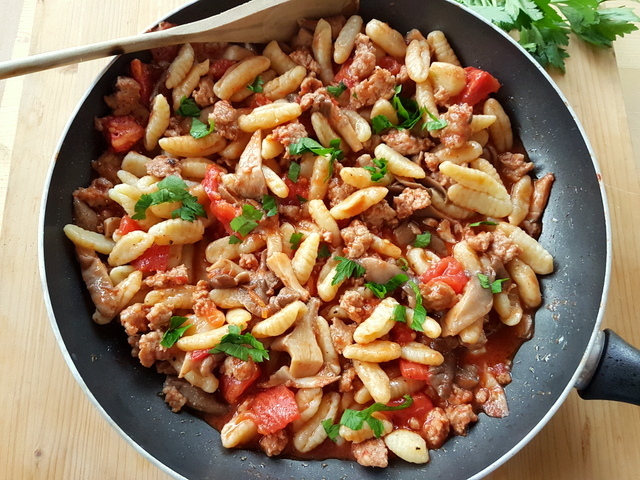 Among those also here on the Pasta Project are gramigna with sausage ragu, a traditional recipe from Emilia-Romagna, and pasta alla Norcina, from Umbria. 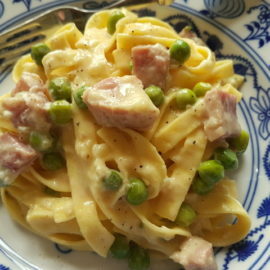 Another favourite sausage pasta recipe of mine is tagliolini alla Langerola, from Piemonte! And, I also love bigoli pasta with luganega sausage from here in Veneto where I live. 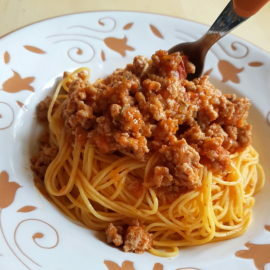 Each of these recipes has a particular taste as a result of the type of sausage used (normally different kinds of local pork sausage), as well as the other ingredients and the type of pasta used. 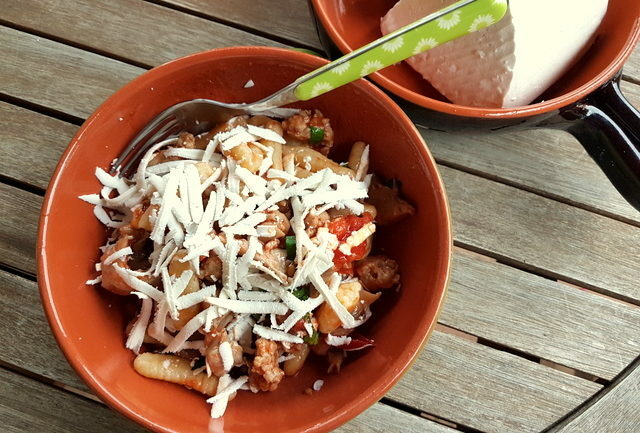 This homemade cavatelli with oyster mushrooms and sausage is as delicious as any of the other sausage pasta recipes I have mentioned and a bit special coz I served it with homemade cavatelli pasta. But, of course you can used dried cavatelli instead! If you have seen my post about cavatelli you will have read that this is probably the most popular type of homemade pasta in Southern Italy. I have long wanted to try my hand at making it myself. Having seen cavatelli made in Sicily and on various videos, I decided that this is a pasta most people can manage to make, including me! 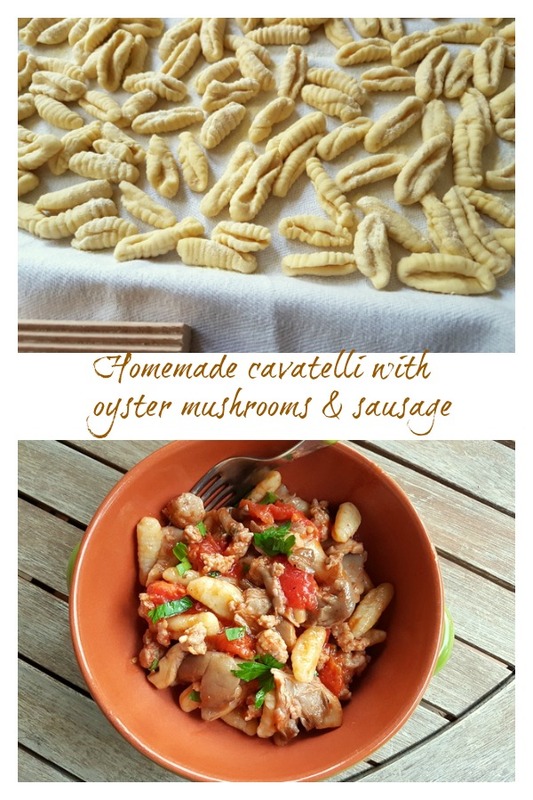 In fact, I was very happy with how my homemade pasta turned out for this homemade cavatelli with oyster mushrooms and sausage recipe. I made ridged cavatelli (cavatelli rigate) using an gnocchi board but you can also make smooth ones with this recipe. The dough for homemade cavatelli is simple; no eggs, just durum wheat semolina flour, tepid water and salt. Some people also add olive oil, but I didn’t. Others use two types of flour; ‘00’ durum wheat flour together with the semolina flour I mentioned before. Italians call this flour ‘semola di grana dura rimacinata’. This means that it has been milled twice to make it finer. What Italians call semola is not the same as what people call semolina in English speaking countries. Although both are made from durum wheat, semolina is coarser, more like corn meal. Semola is finer. Semola is more popular in Southern Italy because most homemade pasta is eggless. The mushroom typically used in this homemade cavatelli pasta with oyster mushrooms and sausage recipe is known as cardoncelli in Puglia. Cardoncelli (Pleurotus eryngii) are the largest of the oyster mushroom genus. In fact, they are also called king oyster mushrooms. They aren’t usually eaten raw because they don’t have much flavour. But, they have been popular in Italy since the times of Ancient Rome. These highly prized mushrooms look similar to other oyster mushrooms, but are darker, meatier and richer in flavour when cooked. I used other oyster mushrooms for this recipe, as I couldn’t find cardoncelli. However, the sauce was very flavourful even though these oyster mushrooms had a milder taste than cardoncelli. You could also use shiitake or even porcini or a mix of different mushrooms. But, porcini will change the taste of the sauce because they have such a strong flavour. 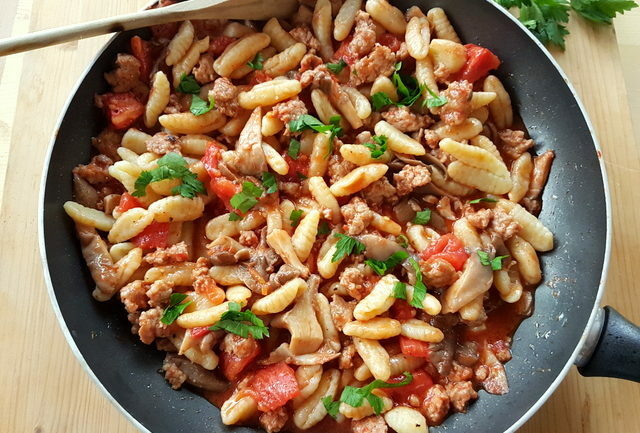 Other ingredients in this homemade cavatelli with oyster mushrooms and sausage recipe. 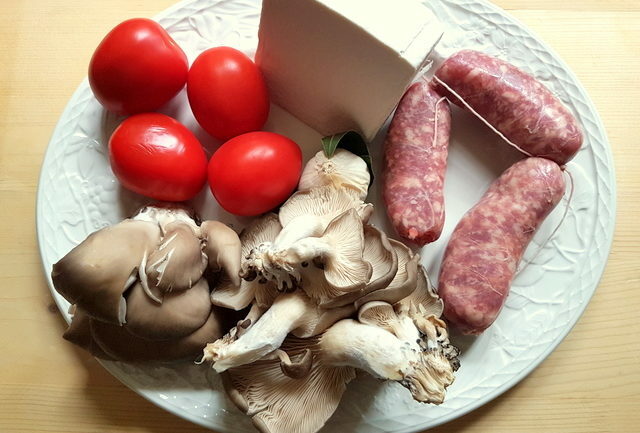 Apart from the ingredients to make the pasta and the mushrooms, I used fresh Italian pork sausages, sauce tomatoes, garlic, white wine, bay leaves and sheep’s ricotta. In Puglia, the most common ricotta for this recipe is ricotta marzotica. This is a type of salted ricotta usually made from sheep’s milk. The name ricotta marzotica comes from the period of the year they make this cheese, around March-April (‘marzo’ means March in Italian). However, since it’s a ripened cheese you can usually buy it all year round (at least in Puglia!). I didn’t use marzotica ricotta but another sheep’s ricotta that’s similar. If you can’t find marzotica ricotta you can also use Sicilian ricotta salata (salted ricotta) or even feta! Pecorino Romano or Greek mizithra can also substitute salted ricotta. Homemade cavatelli with oyster mushrooms and sausage is a perfect comforting autumn/winter dish with a rich flavour. The sauce comes together pretty quickly and doesn’t take long to cook. 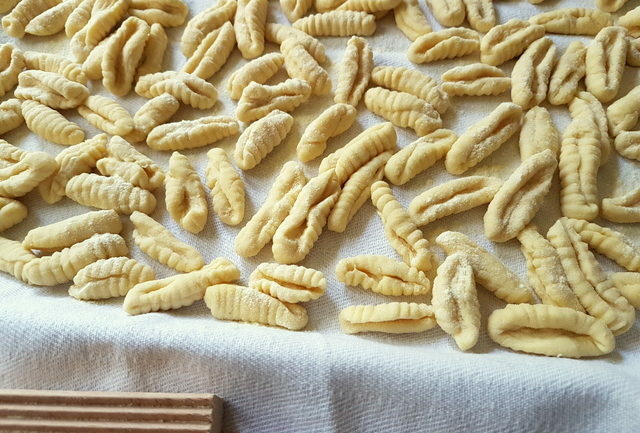 Of course, if you use homemade cavatelli, preparation times will be longer. But, making your own pasta is such a satisfying things to do! However, if you don’t feel up to trying your hand at homemade cavatelli, use the dried version or orecchiette. Orecchiette are also often served with this recipe in Puglia! If you make this homemade cavatelli pasta with oyster mushrooms and sausage recipe, I’d love to hear how it turns out and if you liked it. So, please leave a comment here on the blog or on The Pasta Project Facebook page. Want to save this recipe for later? You can bookmark this page, print this recipe or pin it for later. This easy to make Southern Italian pasta comes from Molise and Puglia but is popular throughout Southern Italy. It's perfect with both meat based and vegetable based sauces. Pour the flour into a bowl. Add the salt and mix. Make a well in the middle and pour the water in the well. Slowly start mixing the water with the surrounding flour. Gradually incorporate all the flour and water and then turn the dough out onto a surface for kneading. Start kneading the dough. If it is too dry add more water, only a bit at a time. If it is too sticky add a little more flour. It should be similar to play dough consistency. Continue kneading for 5-10 minutes until it is smooth and is not sticky at all. Let it rest covered or wrapped in plastic wrap for 10 minutes. Sprinkle 2 rimmed baking sheets with semola flour. 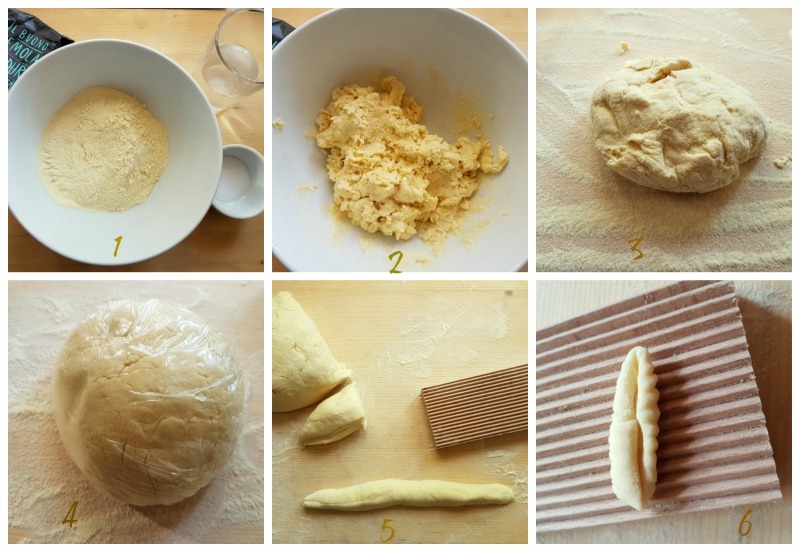 Divide dough into 8 pieces; keep covered with plastic wrap. Roll one piece at a time into a long rope, about 8mm (1/3 in) in diameter, then cut rope into 2 cms (3/4-in) long pieces. Using the tips of your index and middle fingers, firmly press each piece and pull dough toward you so it lengthens slightly and forms a curl in the middle. Transfer pieces to baking sheets. Repeat with remaining dough. I used a gnocchi board so instead of forming the pieces on a flat surface I rolled them down the gnocchi board to create ridges at the same time. Cavatelli can be refrigerated, covered, up to 4 hours. Or freeze the pasta pieces on a sheet or a tray. Once frozen, transfer to a resealable bag. The cavatelli keep for up to 3 months. There's no need to defrost before cooking. 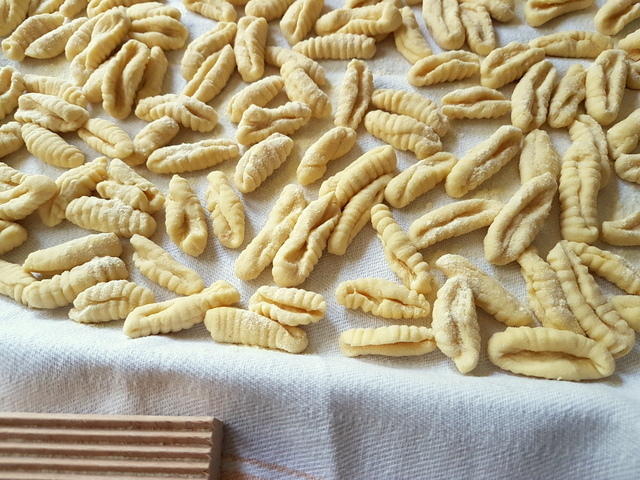 See the video from Pasta Grannies below to see ridged cavatelli being made in Puglia. 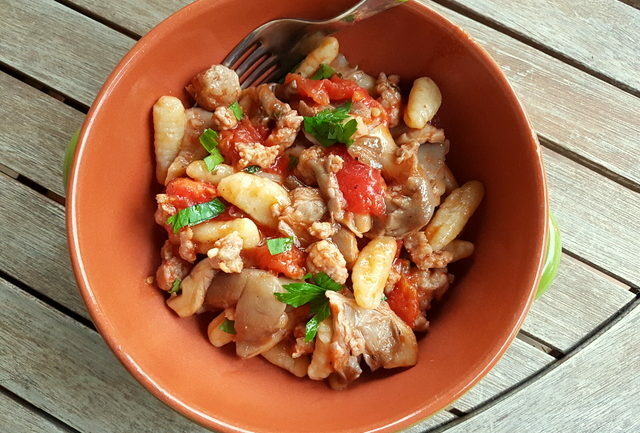 This yummy homemade cavatelli with oyster mushrooms and sausage is a traditional dish from Puglia in Southern Italy. 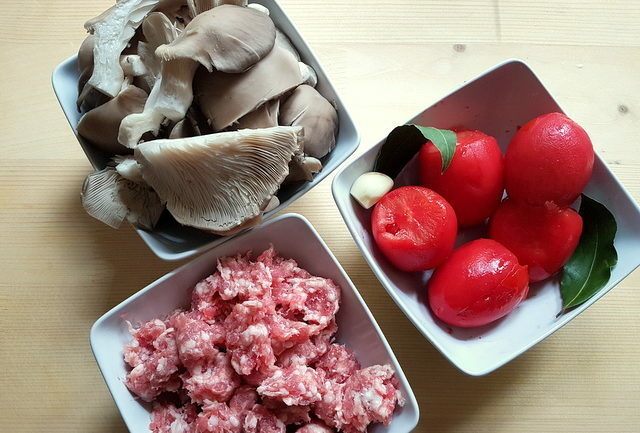 Clean and cut the mushrooms into slices, peel and crush the garlic, remove the skin from the sausages and chop into small pieces, peel and chop the plum tomatoes. Chop the parsley. Heat the extra virgin olive oil in a frying pan or skillet, add the garlic peeled and slightly crushed and fry. 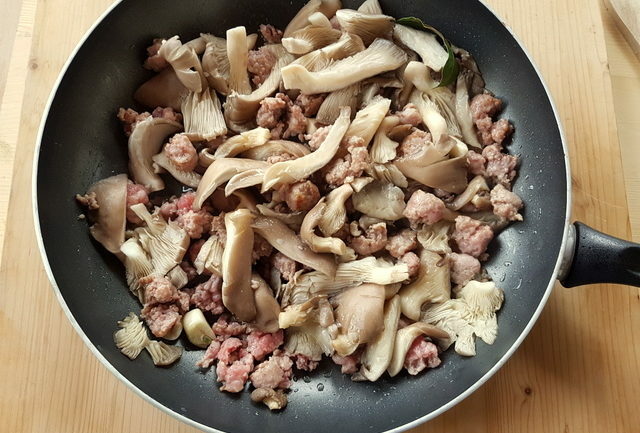 Add the chopped sausage meat and brown a little then add the mushrooms previously cleaned and cut into strips. Cook for a couple of minutes then add the white wine. Let the alcohol evaporate. Add the peeled tomatoes. Crush them with a fork and, after a few minutes of cooking, add the tomato passata. Season with a pinch salt, peperoncino and black pepper and add bay leaves, then simmer for about 15-20 minutes. Remove the garlic. In the meantime, put a pot of water on to boil for the pasta. Add salt once it starts to boil. Bring to the boil again and add the pasta. Cook the pasta al dente according to the instructions on the packet (if dried). Fresh cavatelli will rise to the surface when they are ready, remove with a slotted spoon. Save a cup of the cooking water and drain the pasta. Finally, remove the bay leaves and add the cavatelli to the pan with the sauce. Mix together. If the sauce seems dry, add a little of the saved pasta cooking water. Add chopped parsley. Stir in the grated marzotica ricotta. Serve immediately with more grated ricotta if required. This recipe can be made with orecchiette or other types of short pasta. Instead of marzotica ricotta you can use ricotta salata, feta, Pecorino Romano or Greek mizithra. Watch this video from Pasta Grannies to see ridged cavatelli being made in Puglia Here, they use one finger. I used 2 to make bigger cavatelli. Thank you Ronald! Happy you like this recipe! 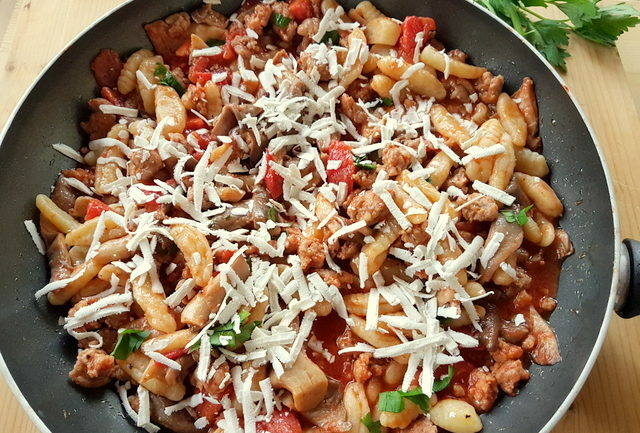 What a hearty and comforting pasta dish, I love that it’s made with italian sausage and oyster mushrooms are among my favorite, this dish goes right into my meal plan! bless you for more sausage recipes! 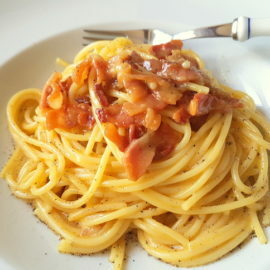 i ve cooked only nyt’s bittman recipr, “the minimalist” which has only 1 tbs butter, sausage, 1/2 cup white wine, romana cheese added at the end, & pasta. but you bring us christmas: choices galore. thank you so much. you’re the best. That looks so delicious! I have never ventured to make my own pasta! You make it look easy enough that even I may be able to tackle it! I love sausage with pasta sauces and these mushrooms look amazing! 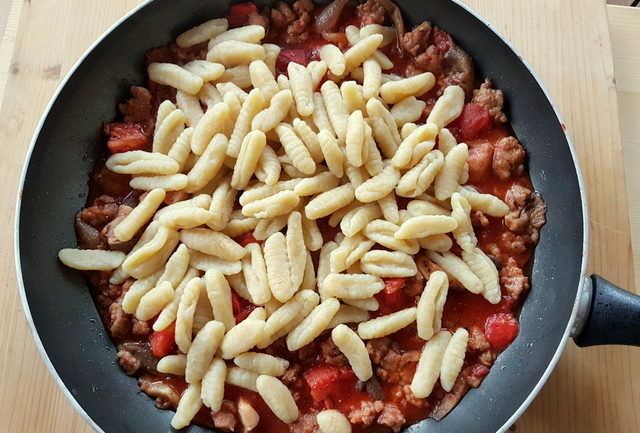 This homemade cavatelli pasta looks FANTASTIC. I am drooling over the ingredients. My stomach is growling thinking about how good it must taste. I have to make this soon. Aww thank you Katie! Homemade pasta doesn’t look as perfect as store bought but it sure tastes better! This sauce is really good too! I’m sure you’ll enjoy it! I love freshly made pasta. This together with the sauce looks so hearty! Grazie Immaculate! Yes homemade pasta is the best! This is a great autumn sauce for when the days get colder! Very hearty! So SO delicious! I love oyster mushrooms and I never have enough of them. They one of the best mushrooms there are. This dish looks amazing and I must give it a spin as soon as. Such a nice and fresh looking ingredients, superb! 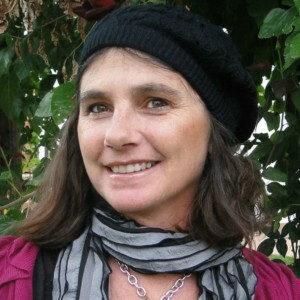 Thank you so much dear Ramona! I also love oyster mushrooms! I’m sure you’ll really enjoy this dish! Wow – you make making homemade pasta look so easy – and not to mention DEEEELICIOUS! Thank you Shashi! Homemade pasta is such fun to make and tastes so much better than store bought even if it doesn’t look so perfect! Oyster mushrooms are some of my favorite mushrooms! I’m so excited about this recipe, it sounds delicious! Thank you so much Danielle! Oyster mushrooms are one of my favourite’s too and so delicious in this recipe! I’m sure you’ll really enjoy this dish Mary! Thanks for stopping by! I really need to try making my own pasta more often – this looks so easy. Total comfort food too. 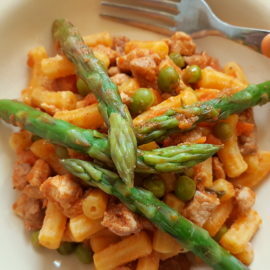 This particular pasta is pretty easy and fun to make Danielle! I hope you’ll give it a try! I’m going to try this pasta out! I’ve made many different types over the years, but I’ve never made cavatelli! Can I adopt the Nonna from Puglia? She’s adorable! Cavatelli are pretty easy to make Kylie. I’m sure you’ll love making and eating them! Yes I love the nonna from Puglia too!